All transactions are safe and secure with a reliable history in online purchasing behind each of our associates. Buy the Jack's Nightmare Nirvana t-shirt to own Nightmare Before Christmas clothing and merchandise. This Nightmare Before Christmas tee displays a mashup of the Tim Burton movie and the Nirvana logo. Here, Mr. Skellington's face replaces the familiar Nirvana smiley face and the word "Nightmare" replaces "Nirvana". Get it for yourself or the Jack or Sally in your life. Sally is a rag doll and a fellow resident of Halloween Town, who fears that Jack's plans to adopt Christmas and impose its culture on the residents of Halloween Town will become disastrous. This piece of merchandise displays an image inspired by The Nightmare Before Christmas movie and the band Nirvana. 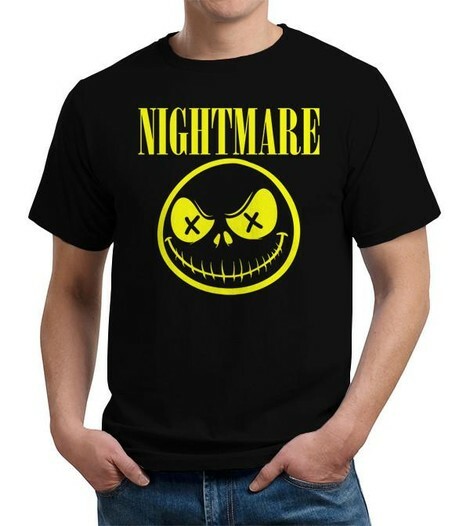 In addition to the Jack's Nightmare Nirvana tee above, browse the Nightmare Before Christmas Clothing Gallery for more apparel like men's and women's clothes, kids shirts or hoodies.